Epiphany Lutheran Church in Colorado is an LCMS church I just discovered this past week, which has a fantastic website full of edifying resources. Take, for instance, the "People of the Passion" sermon series they published during Lent last year. It included sermons from Pastor John Larson, Pastor Roger Wohletz, Pastor Chris Matthis, and Pastor Brian Flamme (who some of you might know from Table Talk Radio). I thought I'd highlight each one of these excellent sermons by featuring them in their own blog post here. So, today, we'll take a look at Judas and what Pastor Chris Matthis had to say about him when he preached on Matthew 26:14-16, Matthew 26:47-56, and Matthew 27:3-10. Grace, mercy, and peace to you from God our Father and our Lord and Savior, Jesus Christ. Amen. Nobody likes a traitor. That’s for certain! How many Americans do you meet with the name Benedict? I don’t think I’ve ever met a single one -- no doubt because of Benedict Arnold’s betrayal of George Washington during the American Revolution. And in The Inferno, Dante’s famous poem about his fictitious journey to hell, he discovers that the worst punishment of all is reserved those who are traitors. In his imagining, Judas Iscariot and Brutus (the man who betrayed Julius Caesar) are held forever in the jaws of Satan within the innermost hell of hells. As I just said: nobody likes a traitor. And so you would think it would be nearly impossible to discover in Judas Iscariot a sympathetic character. Nevertheless, many have tried. Various novelists and playwrights have approached Judas as a misguided Jewish political dissident who only betrayed Jesus in order to try to force his hand to start a rebellion against Rome. In the 1970’s musical, Jesus Christ Superstar, Judas is a man confused and frustrated by Jesus’ seeming lack of focus or determination and his apparent willingness to be whatever the crowds want him to be (that, of course, is not the way things really happened!). In the Martin Scorsese film, The Last Temptation of the Christ (1988), it is Judas who feels betrayed by Jesus (can you imagine?!). And in the non-Biblical, Gnostic Gospel of Judas, Jesus regards Judas as his best disciple and even asks Judas to betray him. While these various literary and dramatic approaches to Judas are certainly interesting, they are misleading and deceitful. Judas was not a hero. He wasn’t even a good guy. Judas was a bad guy. The only true source we have for our knowledge of Judas is the four canonical Gospels of Matthew, Mark, Luke, and John, as well as a few references in the Psalms and Acts of the Apostles. From Scripture we discover that Judas Iscariot was one of Jesus’ twelve original apostles (Matthew 10:1-4), that Judas preached and performed miracles in Jesus’ name (Matthew 10:5ff; Acts 1:17), that Judas was entrusted with the disciples’ treasury and embezzled funds from the group (John 12:4-6), that Judas was possessed by the devil (Luke 22:3), that Judas betrayed Jesus to his enemies for the petty sum of thirty pieces of silver (Matthew 26:15), that he did so with a kiss (Luke 22:47-48), that he tried to return the money after Jesus’ kangaroo trial (Matthew 27:3), and that Judas finally killed himself out of deep remorse for his actions (Matthew 27:5). As I said before, Judas wasn’t a good guy. He was a bad guy. But he didn’t start out that way. Before the name Judas became synonymous with treachery, it was a patriotic name, the name of Israel’s famous hero, Judas Maccabeus, who drove the Greeks out of Israel during the second century B.C. (similar to naming your son George in honor of George Washington). Something else quite remarkable about Judas is that he even believed Jesus was the Son of God! Think about it: he was a part of Jesus’ inner band of disciples for nearly 3 years. He preached and performed miracles and drove out demons in Jesus’ name. And even at Jesus’ trial, Judas agreed that Jesus was "the Christ, the Son of the Blessed," that is, the Son of God (Mark 14:61-62). If, in fact, Jesus was not the Son of God, his claim would be blasphemy. But, as we believe and confess, Jesus is the Son of God. And Judas admitted as much when he told the chief priests, "I have sinned by betraying innocent blood" (Matthew 27:4). In other words, Judas believed Jesus was innocent of any crimes because Jesus was who he claimed to be: God’s Son. Judas was no worse of a bad guy than any of us. "For all have sinned and fall short of the glory of God" (Romans 3:23). Judas was a sinner like the rest of us. And sinners are doomed to die apart from faith in Christ and his forgiveness. But Jesus loves bad guys. He forgave the thief on the cross and welcomed him to Paradise (Luke 23:39-43). He forgave Peter’s triple denial of knowing him and reinstated him, calling him to feed His sheep (John 21). And Jesus loved Judas, even though he knew he was a thief and a traitor. Judas was with Jesus in the upper room on the night of his betrayal. Jesus shared the Passover meal with Judas and washed his feet at the Last Supper (Matthew 26; John 13). At any point, Judas could have turned back and returned to the fold of the faithful -- freely and fully forgiven. Tragically, he never did. So what happened to Judas after he died? He went to hell! I know some of you don’t think that’s fair. After all, betraying Jesus was a dirty job, but somebody had to do it! Nevertheless, Judas is in hell. Some may question how we can be so certain of his eternal destination. For that we turn to the Psalms and Peter’s discussion of Judas in Acts 1. Peter quotes Psalm 69 as a prophecy of Judas’ punishment for his betrayal of Jesus. And in Psalm 69, we hear the judgment of God that Judas would experience unending punishment (Psalm 69:27). His name would be erased from the Book of Life, and so he would not be counted among the righteous -- the people of God who live forever by grace through faith (Psalm 69:28). So why did Judas go to hell? It wasn’t because he was a thief. It wasn’t because he betrayed Jesus. It wasn’t even because he committed suicide. The Bible says that the only unforgiveable sin is to blaspheme the Holy Spirit, that is, to reject the work of the Holy Spirit, which is to bring us to faith in Christ (Mark 3:29; Luke 12:10). The Holy Spirit points us to Christ, and so to blaspheme the Holy Spirit is to reject the forgiveness Christ won for us on the cross (John 14:26; John 15:26). Judas went to hell because he didn’t believe in God’s forgiveness. He didn’t repent of his sin and cry out for God’s mercy. Yes, Judas was full of guilt and remorse (Matthew 27:3), but that’s not the same thing as repentance. Repentance is more than just feeling badly for what you’ve done wrong; repentance means turning away from sin and turning towards Christ for His forgiveness. In fact, the Greek verb used for Judas’s remorse or regret (metamelomai) is not even the typical New Testament verb used for repentance (metanoieō). Tragically, he believed that his sin was too great to be forgiven by Jesus. And so he despaired and died. The tragedy of Judas’s life isn’t that he was a thief or betrayed Jesus. The tragedy of Judas is that he died without faith in Christ’s forgiveness. Things could have turned out rather differently for Judas. After all, he’s not the only one who betrayed Jesus. We all betray Jesus. Every time we sin and break God’s commandments, we betray him. The other disciples all scattered and fled in the Garden of Gethsemane. Peter denied knowing Jesus to save his own skin. If that’s not a betrayal, I don’t know what is. If only Judas would have cried out to Jesus for mercy and grace, he would have received it. The tragedy is that he didn’t. Judas is proof that the Baptist slogan, "Once saved, always saved," is simply not true. Judas is one of the apostate -- those who fall away from faith in Christ. The book of Hebrews sadly insists that it is most certainly possible for believers to fall away from faith; but it’s nearly impossible for them to be restored to repentance "since they are crucifying once again the Son of God to their own harm..." (Hebrews 6:6). Not everyone who says, "Lord, Lord!" will be saved (cf. Matthew 7:21-23). And so in Judas we find an example of the Bible’s warning: "Take care, brothers, lest there be in any of you an evil, unbelieving heart, leading you to fall away from the living God" (Hebrews 3:12). So where is the Good News in the story of Judas? It’s awfully hard to see. But I believe the Good News is that nothing -- absolutely nothing -- could ever get in the way of our forgiveness except for outright unbelief and refusal of God’s grace. In Romans 8, the apostle Paul writes, "For I am sure that neither death nor life, nor angels nor rulers, nor things present nor things to come, nor powers, nor height nor depth, nor anything else in all creation, will be able to separate us from the love of God in Christ Jesus our Lord" (Romans 8:38-39). Remember, even Judas was loved deeply and truly by the Lord Jesus. So do not be so proud as to think that your sins alone are unforgiveable in all of this world. Are you a worse sinner than anyone else? Not likely. The Good News of Jesus Christ is that he offers real forgiveness for real sinners. And so we can take to heart the advice of Martin Luther to his friend Philip Melanchthon: "If you are a preacher of Grace, then preach a true, not a fictitious grace; if grace is true, you must bear a true and not a fictitious sin. God does not save people who are only fictitious sinners. Be a sinner and sin boldly, but believe and rejoice in Christ even more boldly... . Pray boldly -- you too are a mighty sinner" (Martin Luther, Letter to Philip Melanchthon, 1 August 1521). Sin boldly and pray boldly. This, of course, is not license to sin but encouragement to approach God’s throne of grace with boldness and confidence in your time of need (Hebrews 4:16). God shows his love for us in that, while we were still weak and ungodly, while we were still sinners -- while we were still enemies of God! -- Christ died for us (Romans 5:6-10). So no matter what you’ve done or haven’t done in this life -- even if you have betrayed Christ one-hundred thousand times! -- do not give up or give in to despair. "Christ Jesus came into the world to save sinners, of whom I am the foremost" (1 Timothy 1:15). If God can forgive my sins and those of the Apostle Paul -- who persecuted the Church -- then He can most certainly forgive your sins. And He will forgive your sins if you only repent and return to Him. The Lord Jesus has gone to prepare a place for you (John 14:2-3). Your place is not in hell (cp. Acts 1:25). Your place is with Jesus. And His place is on the cross for you. In the name of Jesus. Amen. Imagine that! A sermon about Judas that was beautiful and Christ-centered and cross-focused too! What I absolutely loved about that was how informative it is about a man we tend to often ignore as Christians. Sure, we all know who Judas is and what he did, but I don't think I ever stopped to think about his life and his ultimate refusal to repent and receive God's gift of mercy and forgiveness in such intricate detail like that. I guess that's because it's almost as if there's this unspoken belief out there in Christianity today that Judas could easily be any one of us, and so we stop as soon as that thought enters our heads for fear of where the rest of that thought might take us next. Of course, Pastor Matthis was correct to point out to us that, yes, "every time we sin and break God’s commandments, we betray Him." Yet, after prayerfully considering that sermon, I think there's more to Judas' life story and what it teaches us than that. It's true that we do betray God every single time we sin against Him and so, in that sense, I suppose that it's a necessary warning that any one of us can lose our salvation by rejecting Christ's free gift to us at any time by deciding to live in a state of unbelief, or like our sins are unforgivable, but that's not how most Christians present Judas. It's almost as if Judas is used as a gimmick by some Pastors today to just hammer us with the Law ("See! 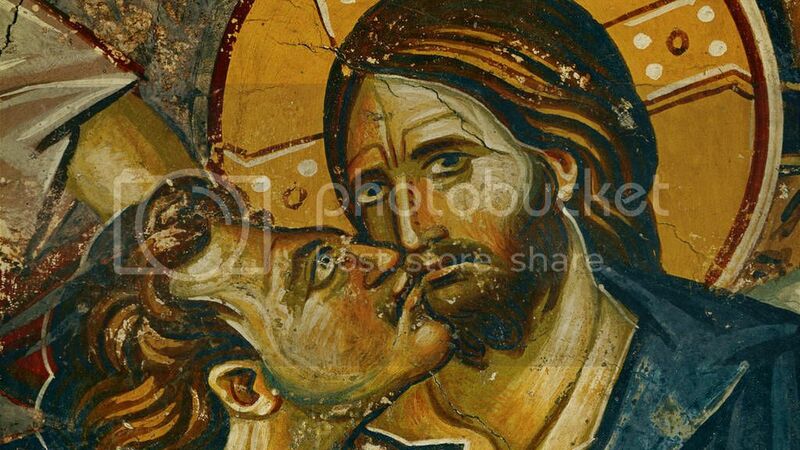 Every time you don't do what you're supposed to do it's like you're kissing Jesus on the cheek just like Judas did! How awful of you! How do you think that makes Jesus feel? Now, go out there and do more in His name, and do it better!"). Again, in a sense, yes, we are all like Judas. We are all like Judas -- to a point, but only in so far as we have betrayed Jesus whenever we have sinned against Him, but then also failed to believe His Word and believe His promises to us, namely, the promises made to us in Baptism and the Lord's Supper. That's where the similarities end though. Judas' tragic end does not have to be our own. In the end, Judas sought absolution from the corrupt priests who refused to give it to him by directing him to God's grace (Matthew 27:4) when he should've simply sought absolution from Christ who would never refuse to forgive him for his sins of betrayal and theft. This faith shows the distinction between the contrition of Judas and Peter, of Saul and David. The contrition of Judas or Saul (Matthew 27:3-5; 1 Samuel 31:4-6) is useless because faith is not added. Faith grasps the forgiveness of sins, given as a gift for Christ's sake. So the contrition of David or Peter (2 Samuel 12:13; Matthew 26:75) helps because faith, which takes hold of the forgiveness of sins granted for Christ's sake, is added to it. Whenever the Law alone exercises its office, without the Gospel being added, there is nothing but death and hell, and one must despair, as Saul and Judas did. Judas ended his life in despair, while Peter, who also betrayed Jesus, ultimately trusts in Christ, who alone can save us from guilt and despair, from sin. As Christians, the mere fact that we repent when we sin, that we return to our Baptism, and that we also believe, teach, and confess "the faith that was once for all delivered to the saints" (Jude 1:3) clearly demonstrates that we are nothing like Judas. Oh, let us ever flee to You, Christ, when overwhelmed by our sin! Let us not despair but know the depth of Your mercy. Amen. In a Lutheran layman's terms, Judas was damned because of his unbelief, not because of his theft, betrayal of Jesus, or suicide, and our takeaway should be that we would believe in the unconditional forgiveness of Jesus Christ.